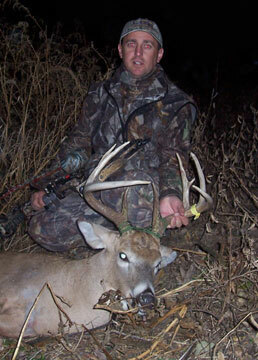 Archery deer hunting in Mid-America Hunting Association is to have multiple stand locations on multiple farms. Choosing from day to day, morning to evening, based on season, weather, wind of where to hunt. Deer hunting is throughout any season for Mule or Whitetail. Covering our three state region of Iowa, Kansas, Missouri. All hunts are on 100% private land we lease for our exclusive Association hunter use. Even though we are a self guided hunter organization we do assist first year Association hunters giving ideas of where to get started. Our purpose is to take away as much mystery of good spots by region of each state. Right down to where to park trucks, step out, put up stands. After any hunter’s first season he is encouraged to build out from where he has started. Most archery hunters will start out scouting somewhere between 2,000 to 4,000 acres finding three to five farms they would consider first choice, must hunt locations. Having much land coverage makes options from day to day plus which stand to fit any rut phase or local movement pattern. Adding to coming back as often as wanted often brings more opportunity at eyes-on a trophy as well as achieving failure. Whatever outcome, self guided Association hunters achieve any level of success on his own without anxiety of hoping to have a spot. We add to this tranquility as we have enough land to insure any one hunter should not see another on any one spot he is hunting. We have enough land no one needs fall in right after a previous hunter. None should be stepping over boot prints of another or, come sun-up has stands in sight. All land use is by a reservation to a numbered spot. Intent is hunter separation. 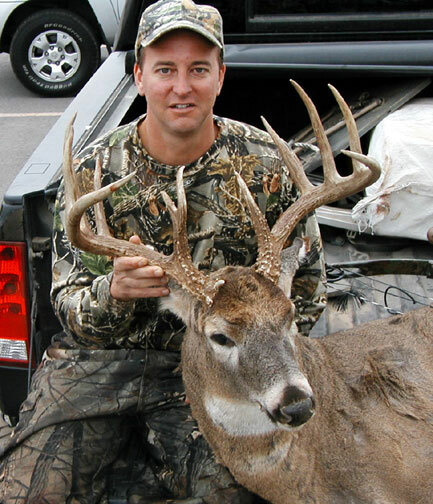 Mark, was an Association archery deer hunter for 11 years before he was forced to look for another group of spots. His traditional farm had sold. He said he’s going to return to his new spot next year. Every so often we receive a telephone call from an applicant who seizes on information such as this picture’s caption. Focusing the negative of land lost. Any hunter may not always be able to be on any same spot from year to year. This is true. It reflects reality rather than an ideal some folks unreasonably expect. All must recognize land use will change over years. Landowners die, some retire, sell land, etc. Same for us as it is for any who secure a private land lease. But, we are better. Each scouting trip, fall hunt or spring turkey season each hunter should add one more prospective spot to his personal inventory of where he may want to spend a day in stand. Most Association hunters have knowledge of more spots they would like to be on than time on a trip will allow. 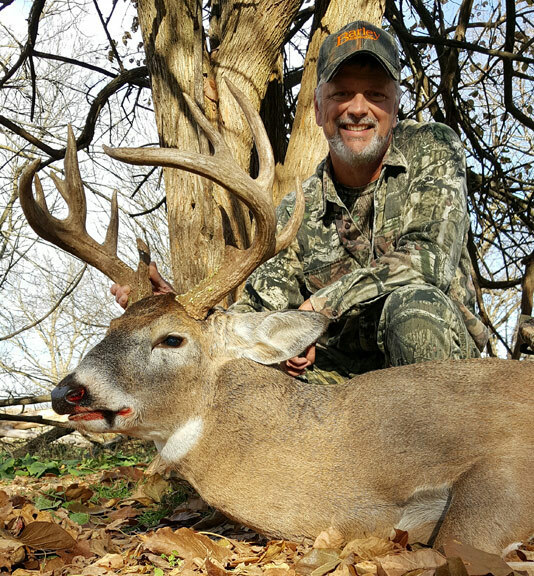 Dennis, dedicated Association whitetail hunter on late season deer hunting trip. 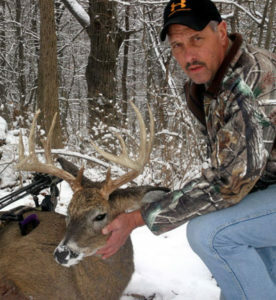 Dennis has been in his Association for 30+ years He has a whitetail collection which rivals many. Average acreage per hunter per spot is 160 acres, a 1/2 x 1/2 mile square quarter section. Largest pieces of land to be expected is a full section at 640 acres. Smallest we will break down any one farm is into 80 acres numbered/lettered subparts. Any farm broken into 80 acres per hunter is a good farm in terms of cover combined with locality. Intent is not a hunter on each 80 acres each day. When going to one of these better spots hunters commit to a specific location. He does not put pressure on surrounding land by simply walking through it. These type of hunter pressure controls are some of what separates Mid-America Hunting Association from other private land hunts. Not only do we prevent over pressuring any one deer hunting lease we also have other prohibitions. Prohibit off road motorized vehicles ATV or otherwise. No camping on our leases. No guests. No drive, party or any type of gang hunts. We want our deer hunting lease land as un-pressured as we can make possible before any hunter’s arrival. We bow hunt themselves. They know full well how challenging it is to stay in stand just to get eyes-on a trophy let along draw back on one. This drives our operation as a business. We are not a deer hunting club. We know what quality of day it will take to insure most, never all, self guided hunters return for years of seasons to come. One key point is we offer quality deer hunting. Meaning, private land, pre-season scouting, leasing land in part of each state giving a good return for hunters. Never will we make any claim to be a trophy whitetail organization as most should agree 90% of hunters on any season anywhere will not harvest a trophy. To think otherwise would be foolish. Call us days/evenings on most days to ask questions or address concerns. If after covering our rules and agreeing we are a good fit for each other all what is left is to mark his calendar making full use of scouting and hunting time as much as he can. 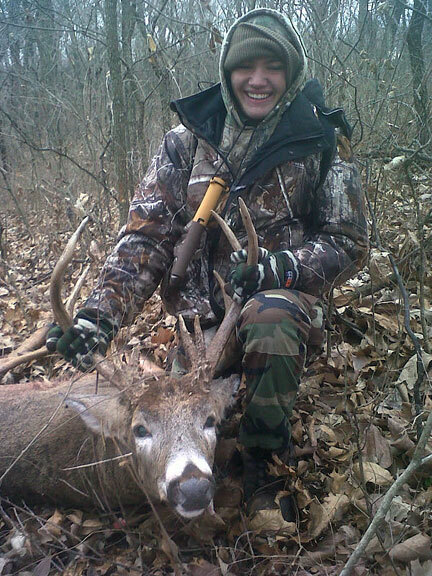 Bryce, his first buck ever. Cody, his first week in his new club. Mid-America Hunting Association has been around a long time, long enough so our original four hunters who started it in 1965 are no longer with us. The current Owner/operator is Jon Nee. He bought MAHA in 1981 after having been its manager for several years. Finally getting around to writing you to share my impressions of MAHA. I joined in April [last year] after I came across your organization while searching internet options. I had made two hunts in area the club has ground in MO and IA. I had before MAHA hunted in a group of individuals who bought land with a single house near [location deleted], IA who formed a small scale club like MAHA. They had access to some pretty good land. But I felt like I could only access it through a friend who was part of this group. I wanted more control of my own destiny. I was a bit skeptical at first but after looking over much of your web site I made a call to join. I am very happy I did. As a person in business myself I want to compliment you on how you represent your organization. I have found everything you represent in presentation and in your personal interview to be true. People in the Midwest are great. We stayed at Lakeview Motor Lodge in Trenton, MO last year and after 10 days there felt like we’d know some of them for years. 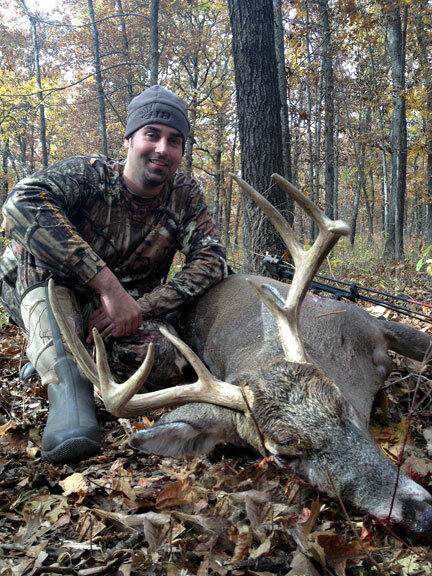 Your web site scouting section’s advice to eastern big woods hunters was spot on. I don’t know how many times I’ve read some of those articles but I never get tired of them. I’m not a true trophy hunter yet but I absolutely agree on your observation when good hunters get on trophy potential ground, they’ll push themselves to target bigger bucks each year. I also like how you represent what this club is contrasting against what it is not. It was a lot of work to scout ground from 1,000 miles away but I have come to really enjoy this part of deer hunting during off season. I have learned to use the available tools. I have been pleased on my assessments I have been able to make with a combination of aerials with topographic maps. People look at me kind of funny when I pull up my maps on a plane or at lunch during work but this is the next best thing to being there hunting. I plan to be a part of the club for many years. I like you plan to be around a long time as well. I think it’s really important to remind people you are training future owners of the business and feel good every time you share info on the next generation of owners. I know you don’t make referrals based on casual interest, I think that’s right but if you need a perspective of a fairly new member from a heavily hunted eastern state like Pennsylvania I’m more than willing to share my positive experience. Keep my email address on file or leave a message at my office number below. I’d be more than happy to give an honest account of my experience. Take note of the deer cart. We not not allow off road access to our lease land. Put an ATV out on the land and that is 10 hunters worth of pressure. The poles at upper left are for a tripod stand this hunter uses in his home state that does not have trees to support lock-on or climbing stands. 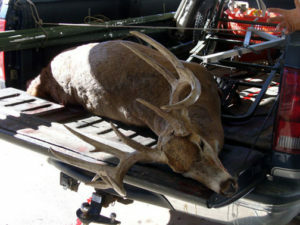 That should give good indication of the thousands of miles he drive to hunt with his Association. Also, about some of our open land hunting having scrub, not trees. Finally, see the rack sticking up out of the bucket, upper right of the picture. 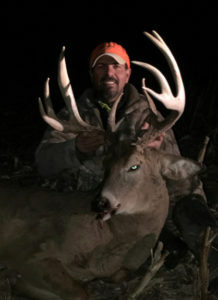 Many hunters find October archery hunts successful due to being able to rattle or grunt in bucks as well as finding decoys and attracting scents effective. Past success history is not a prime criteria of where to recommend anyone hunt. Time worn experience since 1965 shows lighting or trophy whitetails rarely strikes twice on one spot. Proof of this comes from our most successful hunters as well in terms of those with the most recurring success. We listen to how they say they hunt added to our experience leasing land and in stand. The most successful do it yourself hunters while they may hunt some of the same land from year to year always add new land to their reservations. If in fact the same lease was where they found recurring success they would hunt that same farms all the time. The reality is as we identified earlier to the contrary with all successful hunters always working to increase their land options through yearly scouting and spending season days on a number of farms. Both previously hunted as well as new to that season. A business not an archery deer hunting club. We operate as a business and as such we seek returning customers earned through hunters getting the hunt they are after. For the most part the archery deer and duck hunters have the highest renewal rate in the Association. The cause for this is as deer bow hunter feedback repeatedly shows it is simply due to opportunity to have an abundance of acreage over a wide area which allows a hunter to select where to hunt. Feedback continues that no other hunt option to be found outside of huge tracks of federal lands out west can a bow hunter find this amount of acreage for our cost. Wanted to email a few pictures of the buck I shot in [location deleted] with my bow. Thanks for the recommendation on the [location deleted], it paid off. Thanks again. You and your staff do an excellent job! Deer lease habitat is a constant point of interest. This next picture series below is one small snapshot into a lease surveyed this past spring, looked over again this summer then contracted. Current members want to know about new Association leases or leases with good rack sightings. New members want to know where to hunt. Prospective members seek to know what they are getting into. This lease is a tougher one. The far creek bottom is 3/4 mile walk and the levee and main stream further beyond. 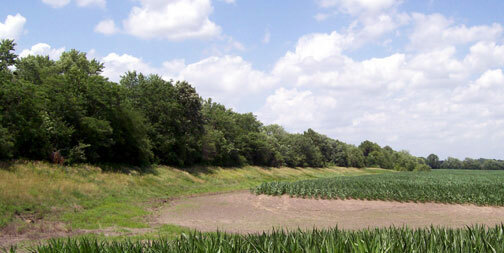 Classic agricultural region of wooded creek bottoms and small wood patches cutting through grain crop fields. The levee on this lease, higher ground at left, is farmer built and owned as opposed to COE levees. 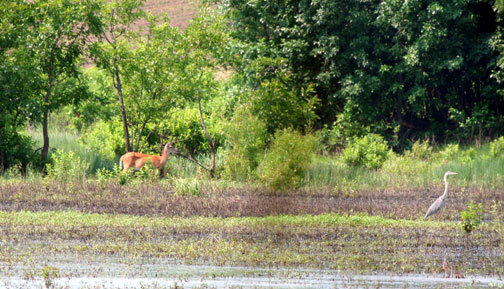 This leaves all land from levee to waterline private hunting land and available for our deer leasing. That boundary is brush and tree filled as thick as any to be found with a food source grain field running its entire length. Then there are spots like this on the farm side. Levees stop water on both sides.